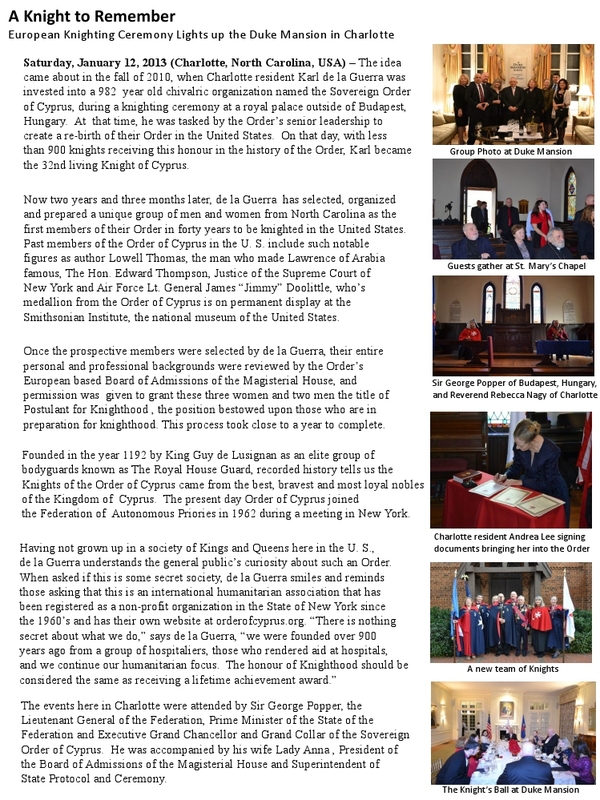 After 40 years a Knight Investiture of the Sovereign Order of Cyprus was held again in the U.S.
Saturday, January 12, 2013 (Charlotte, North Carolina, USA) – The idea came about in the fall of 2010, when Charlotte resident Karl de la Guerra was invested into a 982 year old chivalric organization named the Sovereign Order of Cyprus, during a knighting ceremony at a royal palace outside of Budapest, Hungary. At that time, he was tasked by the Order’s senior leadership to create a re-birth of their Order in the United States. On that day, with less than 900 knights receiving this honour in the history of the Order, Karl became the 32nd living Knight of Cyprus.